have a lot of radios and antennas, a lot of days on the air and enough operators to keep making QSOs day after day. And that is exactly what we did, piling up about 10,000-15,000 contacts each day. That wasn’t always the plan. 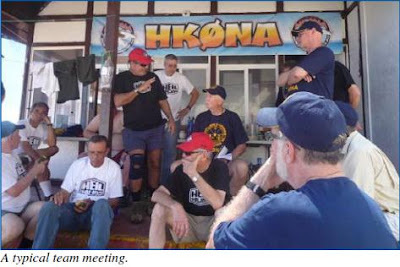 Originally when the DXpedition to Malpelo Island was first announced, there were to be six Colombian (HK) operators and four foreign operators. When Gregg Marco, W6IZT, and I were invited to join the team, we rec- ommended expanding to 14 total by adding more foreign operators. Then one day, we saw on the DXpedition website that we were now co-leaders. It was news to us, but in the end we played important roles in the op- eration. Gregg was asked to handle equipment procurement, antennas and the IT requirements; I was to handle fund-raising, public relations, and help build and manage the operator team. In October 2011, three team members con- ducted a recon trip to the island. 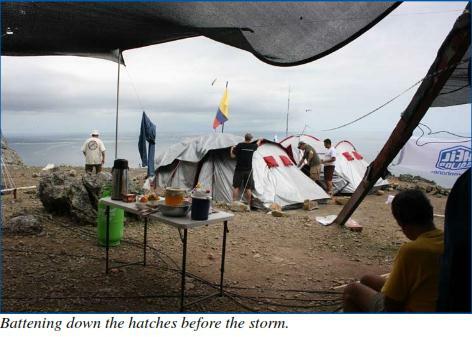 While on Malpelo, the Colombian Marine contingent stationed there had shown Jorge Prieto, HK1R (the DX- pedition organizer), Faber Mosquera, HK6F, and Sal Gechem, HK1T, the way to the top of the highest peak on island. This literally opened up a whole new world to them; they had a 360º view of the entire radio world. All the previous DXpedtions to Malpelo had been conducted from the only flat spot on the island on the eastern side, about a third of the way up. This location was blocked, radio-wise, from about north through west, and all the way to south as the steep mountain walls rose sharply another 600 feet from this normal QTH. As a result, contacts in the past with the West coast of the U.S., Japan, Asia, the Pacific, Southeast Asia and VK/ZL were hard to come by. They now saw a way to change that! In fact, Jorge decided we had a chance at the QSO world record for a non-hotel, non fly-in type DXpedition (the record was set by the 2008 Ducie Island DXpedition, VP6DX). After his return, Jorge contacted Gregg and me and said we needed more radios, amplifiers, antennas, generators and operators. With that decision, the die was cast. I quickly sent a few emails and made a few phone calls and issued more invitations, growing the team to 20 operators. Like most DXpedi- tion leaders, I have a list of people who I have been on DXpedtions with before and know people I can trust to do a good job under diffi- cult circumstances. Looking at the HKØNA operator list, you will find relationships going back to 1997 that began at VKØIR. I did inherit some operators from the original team, and although they had little DXpedition experience, they were all successful contest operators. Gregg, George Nicholson, N4GRN, and I flew to Cartagena, Co- lombia, the first week of November to meet with our Colombian coun- terparts and to make some critical decisions. We made friends easily and we all shared the belief that safety was our primary goal, and we would do everything possible to protect our team from injury or worse. The near vertical island is difficult to access from the sea and there were incidents from previous DXpeditions there where team members were injured and in one instance, a near-fatality. Faber, HK6F, is a safety/rescue expert in his profession and George, N4GRN, was on a cave rescue team years ago. Together they devised a plan to install a winch system to hoist people and equipment safely onto “El Tangon.” This is the struc- ture put in place by the Colombian Navy some years ago to facilitate the re-supply and changing of the personnel stationed on the island. Additionally, they decided to install safety cables at the more dangerous and difficult parts of the climb to further reduce risk to team members. As with most of the equipment used on the DXpedition, the necessary cables, clamps, harnesses, screws, etc. were purchased in the U.S. and shipped to Colombia via a freight forwarder in Miami. Utilizing Yahoo Groups, team members became better acquainted as the plans for a successful DXpedi- tion were discussed, modified and finalized. There were a lot of emails from team doctors (WØGJ, KØIR and primary physician, K9SG) urg- ing us to get our old bodies in shape. The youngest team member was 24 (Manu Siebert, LU9ESD), the oldest, 74. This was to be a physically tough adventure for most of us. 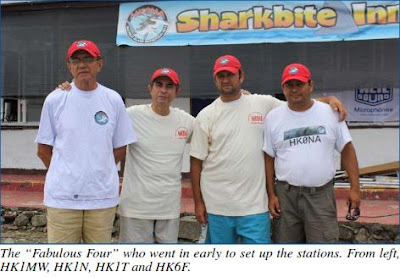 Four team members — Bolmar Aguilar, HK1MW; Faber Mosquera, HK6F; Jaime Gomez Rueda, HK1N, and Sal, HK1T — arrived on Malpelo in late December on the monthly Navy resupply ship ahead of the full team to establish the operating sites, put up the antennas, and set up radios, amplifiers and the genera- tors. Although December was sup- posed to be the dry season, they were plagued with terrible weather, raining almost every day. They completely prepared operating site B (Op. 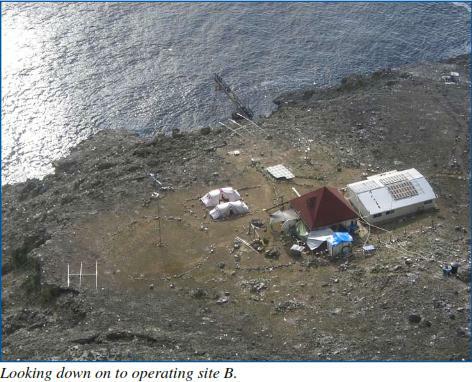 B) and got about 40% of the antennas and equipment up on the mountaintop to operating site A (Op. A). On 10 January, when it was apparent that they had done about all they could do, and further progress was strictly weather-dependent, we told them to begin using the official HKØNA call sign. Using their own call signs, they made about 1,200 QSOs, but after they began using HKØNA, they made about 11,500 QSOs prior to the main team arriving on 21 January. This was part of our overall strategy to break the VP6DX record; more importantly, that decision gave DXers more time to get into the log. The main team met in Bogotá on 18 January; for some it was for the first time. The next morning we flew to the port city of Buenaventura, checked into our hotel and began our first team meeting shortly afterward. Agenda items included the itinerary, safety procedures, equipment, anten- nas, power, and getting on and off the island. Additionally, Glenn Johnson, WØGJ, went over the computerized scheduling program that he and Rob- ert Chudek, KØRC, had developed. It was really quite sophisticated and looked like it would solve our sched- uling challenge. The doctors each talked with us about our responsibilities to both our teammates and ourselves. The biggest concerns were falls, broken limbs and sun-related ill- nesses; dehydration was a problem on Desecheo and we were briefed on warning signs in our teammates. We had set up a water cooler and icemaker at Op. B, making it easier to get a drink of water. Since most of the outdoor work was already completed at Op. B, that would keep us out of the sun as well. Our charter vessel, the SeaWolf, transported us on the 24-hour transit to Malpelo, departing at 0400. I only remember the sound of the engines as we left Buenaventura and when we were in the open sea, the motion of the boat changed significantly. We had rough seas all the way and most of the team slept late, missing break- fast. At 0500 the following morning, the engines slowed as we raced top- side to get our first glimpse of “the rock.” It looked just like the pictures, except bigger. As the sun rose, we began ferrying men and their per- sonal gear to “El Tangon.” Some climbed the rope ladder, but most were hoisted up like sacks of pota- toes using the hoist system. Then, usually in groups of two or three, was the climb to the marine base, the location of Op. B. A few folks made it in 25 minutes or so, brag- ging that they made no stops; I, on the other hand, took 45 minutes and made eight stops to rest and hydrate. Eventually everyone made it up to our home for the next 16 days. All the antennas were up, and the radios and amplifiers were neatly placed on tables lining the wall of the small building Jorge had negotiated for our use — six stations in all. All this, because four guys we called the “Fabulous Four” went early to setup. We are all indebted to them and thankful for their sacrifice. That should include DXers worldwide because you had a longer opportunity to work us and hopefully put a new one in your logs. While Gregg, W6IZT, loaded the final version of N1MM into all the computers, sev- eral men set up two sleeping tents; others made in- terference checks among the stations. We were on the air at noon (local) the same the day we arrived. The pile- ups were huge as the No. 12 “most wanted” DXCC entity came on the air with six stations simultaneously. We implemented the computerized schedule that had been so painstak- ingly developed and began to settle into “DXpedition mode” i.e., sleep, eat, oper-ate and do chores. The pileups would continue non-stop for 15 days. We still had to get Op. A at the top up and running. We had purchased a sturdy operating tent at the last minute, checking it as excess bag- gage on the trip down. We feared that the operating site was so exposed to the weather, and because winds up to 60 mph had been observed the previous week, we were uncomfort- able with the existing complement of tents. Several of our guys and four to five Marines carried the tent, a single generator, a couple of antennas, masts and personal gear to the top. Although the site was only 600 feet above Op. B, the climb was circuitous and dangerous. In those places where a slip and fall would have sent a man tumbling down the mountain, the “Fab 4” installed safety lines; the last 50 to 60 feet were the scariest. 14,000 QSOs with Asia and for many it was a new one. Not all of the team was able or inclined to pull shifts on the moun- taintop, so our computerized sched- uling that had been done in advance was out the window; instead, we took pen and paper and put a chart on the wall. The guys at Op. A did their own scheduling based upon who was “on top” and kept the three HF stations and a 6M station on the air almost around the clock. They had fewer operators to share the duty so they worked harder! At Op. B, we assessed our talent and the operators’ interests and crafted a schedule that seemed to satisfy everyone and maintain our QSO rates. When we realized that the “tent and generator” QSO record was within reach, we had a meeting and decided to modify the schedule, using more experienced operators on more shifts and reducing shifts for the less experienced. For the following six days, some were pulling four to five three-hour shifts over a 24-hour period, while others were reduced to one or two. This enabled us to keep the daily rates high even as the de- mand for QSOs and the pileups began to diminish. We collected the logs at each station once a day around noon and posted the cumulative number. We made between 12,000 and 15,000 QSOs per day, but it seemed we would never get there. Op. A was shut down on 3 Febru- ary and everything was brought down the mountain. It was sad in a number Battening down the hatches before the storm. of ways, as their success was critical to our overall QSO count, and the team really didn’t want it to end. They were literally at the top of the world with a view and radio condi- tions that were unequalled. With everyone back at Op. B, there was not enough room for everyone to sleep, to say nothing of the fact that we now had too many operators. A decision was made to send the Op. A guys and a few others to the SeaWolf for some R&R and maybe a beer or two. We kept four stations on the air un- til noon local time on 5 February and we were completely off the island by 1900 local time. The QSO total was 195,000-plus; we couldn’t believe it ourselves! We had 20 men from six coun-tries, with the majority coming from Colombia and the United States. We spoke four different languages, although English was the language of convenience. There were times when we thought we were being understood and times we thought that we under- stood what was being said to us. Well, it didn’t always work out that way. There were misunderstandings and differences of opinion and different cultural challenges, but to the team’s credit, we worked through all of those challenges and all went home as friends or, as the Colombians prefer, compadres! It was a great adventure and everyone returned home safely with stories to be told and retold for years to come. 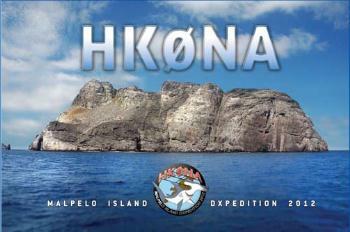 I want to close with a word about DXpedition funding, especially as it concerns the rare “most wanted” entities. They are rare for a reason. Usually there are political restrictions or they are geographically dif- ficult to reach, or both. 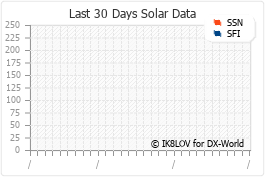 It’s common for the DXpedition team members to pay 50% to 70% of the total costs of these kinds of DXpeditions, but the remainder must come from DX clubs, DXers and of course, DX foundations. NCDXF is always at the forefront of these expensive DX- peditions and without its financial help some DXpeditions would never take place. I urge you to please con- tinue your support of the NCDXF and your other favorite DX founda- tions.